Ascella Log Monitor 1.0 free download. Ascella Log Monitor monitors the Windows event logs at real-time for any activity that matches the specified rules. Ascella Log Monitor monitors the Windows event logs at real-time for any activity that matches the specified rules. Snare for Windows is a Windows NT, Windows 2, Windows XP, and Windows 2003 compatible service designed to interact with the underlying Windows Eventlog subsystem to facilitate remote, real-time transfer of event log information. 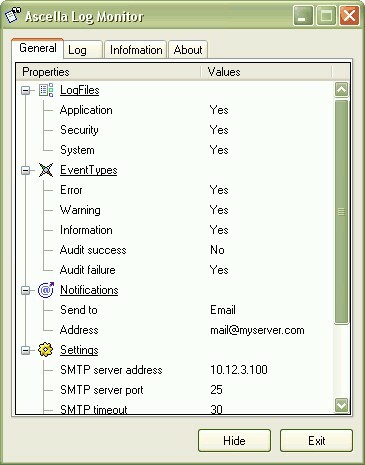 Event Engineer lets you to quickly gather and organize your event logs from all of your connected servers. Events notification plugin is an external plugin created to send messages about events generated by the Advanced Serial Data Logger software. Server Monitor Free is for anyone who wants a simple monitoring and doesn't want to spend a lot fot it. PHP SMTP Server is a SMTP server application that can be used as a local SMTP server or as a corporate high-performance SMTP server. Server Monitor Lite will constantly run in the background and lets you to closely monitor your server and immediately notify you of problems via SMS and Email. Tail XP - ever wanted to follow a log file or capture debug messages without having a debugger at hand? Tail XP - have multiple types of monitor , including : eventlog , syslog , file monitor and more. ManageEngine OpManager is a comprehensive, easy to use and affordable Network, Systems and Applications monitoring application that offers integrated fault and performance management functionality. IPCheck Mobile GUI will help organizations to monitor critical network resources and detect system failures or performance problems on a PocketPC, using Paessler's IPCheck Technology. Antiy Ports is TCP/UDP Port to Precess Mapper,Support Windows NT/2K/XP/2003, the user must belong to administrator group In NT system, is requires the file psapi. UpdateXpress is a network administration utility that dramatically simplifies the propagation of updated files across the network. SERVed is a Xdcc Catcher/Bottler server file designer. Did you ever get bored with your old MAC address? :) If you did, this is the solution! Mac MakeUp let's you change the MAC address of any of the interfaces present on your Windows 2000/XP/2003 box.